Essentially creating a permanent lunar eclipse, could a moon orbit around a planet so slowly that it is always opposite the sun from its planet? where $GM_E$ is the standard gravitational parameter of the Earth (about 3.9860E+14 m^3/s^2) and $T$ is the period (about 365.2564 x 24 x 3600 sec). You should get about 2.2 million kilometers. It turns out that because the Earth is orbiting around the Sun, the added gravitational effect results in a location a bit closer, about 1.5 million kilometers from the Earth, where a low mass object would tend to remain at the far side from the Sun of the Earth for a while. This location is one of the five Lagrangian points, and has the designator Sun-Earth L2. There is a similar point L1 between the Earth an the Sun as well. However, this is not a stable orbit, even in a perfect circular restricted three-body problem (CR3BP or CRTBP) scenario, the least little displacement would cause it to eventually wander away into it's own, somewhat chaotic orbit around the Sun within a few years. The reality of the more elliptical orbits of Solar System bodies plus gravitational perturbations would only reinforce this instability. So find a way to give the hypothetical moon a propulsion system to do station keeping maneuvers to keep it there, and you've got almost what you are looking for. The problem is that this point is in the same neighborhood as the point where the Umbra of the Earth's shadow disappears. 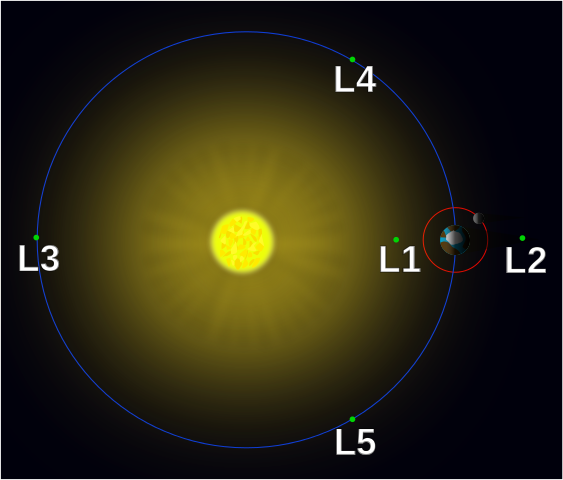 Since the Earth's orbit is elliptical, the point where the umbra terminates moves a bit, and since there is no exact definition of a Lagrange point's location for a messy, realistic Solar System, the question of whether a satellite in the vicinity of L2 would be in partial or total eclipse is debatable. If you already have the propulsion to do station keeping, you could possibly move it in to the umbra and maintain it there as well. Not the answer you're looking for? Browse other questions tagged orbit natural-satellites lunar-eclipse or ask your own question. Is there a computer simulation that anyone knows of that describes the loss of a moon as it's orbit extends beyond the Hill Sphere of the planet?